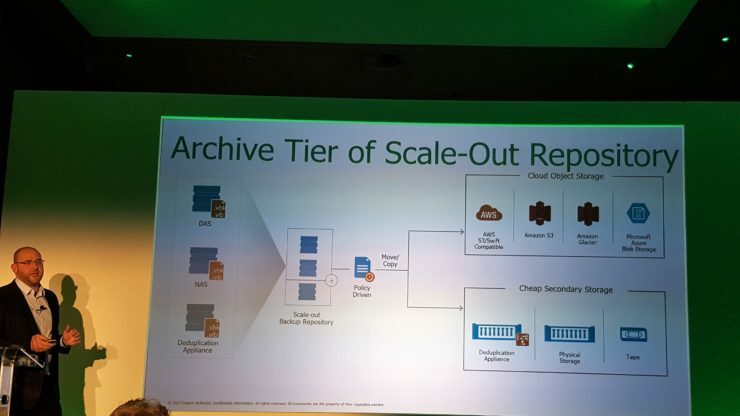 I’ve just returned from the VeeamON Forum in London I wanted to share some of the news that I picked up during Michael Cade’s session – What’s new in Veeam V10. It doesn’t seem that long ago since Veeam version 9.5 was released but Veeam version 10 doesn’t disappoint with additional features. 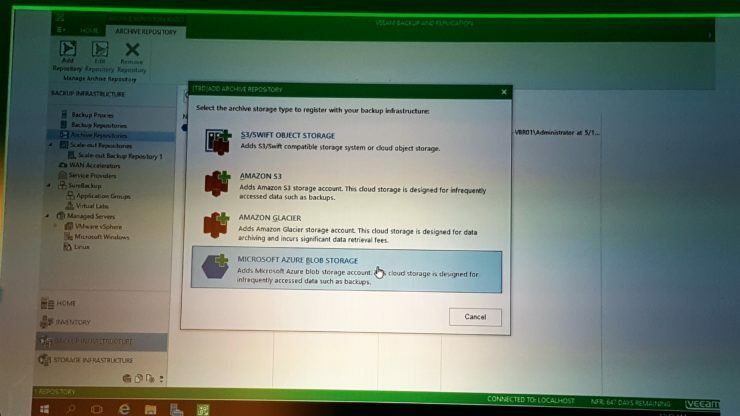 Agents – became available in Veeam 9.5 and allow the backup of physical machines and VM’s in the cloud. This was a welcome feature, the only disadvantage was that you had to manage your agents from a separate interface. Version 10 allows you to manage all your agents from the standard Veeam Backup and Replication Console. Management of agents will be standard in version 10 from the B & R Console but if you’re on 9.5 you can also get this functionality early by applying update 3 which should be available shortly. 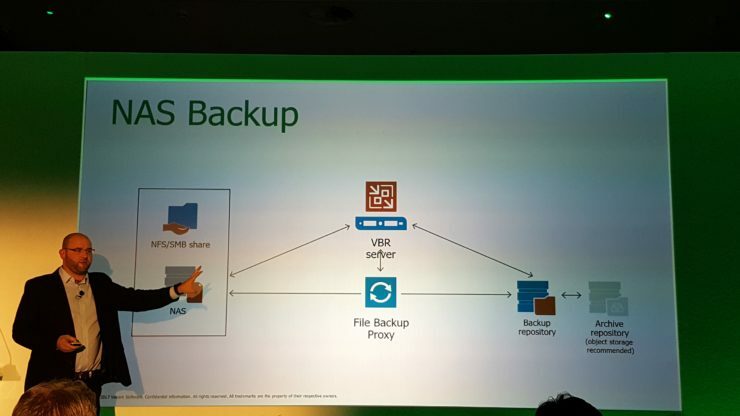 NAS backup – this was a real chink in Veeam’s armour previously as there was no way to backup NAS devices. The presenter mentioned this was one of the most popular feature requests, no surprise there. Version 10 will allow backups of NAS devices, and this will not be NDMP based. The feature is actually enabled with the addition of a new proxy role, the File Backup Proxy. This backup method allows the backup process to be vendor agnostic and also allows out of place restores to be performed to any target. Continuous data protection – (CDP) allows for a near zero RPO. Those familiar with traditional continual data protection will remember physical appliances which acted as write splitters. Veeam’s implementation is of course software based and works by harnessing the VMware VAIO API which splits the write and creates a secondary copy of it. The picture below demonstrates a write being written across two different VMware clusters via the CDP proxy. Continuous data protection is configured in the following screen which allows you to specify an RPO in seconds as well as how long it is stored for. Archive tier – will be available as a tier within a Scale-Out Repository. This allows backup data to automatically tier down to cheaper storage and is policy driven. The screen in which you will be able to create an archive extent to your scale out policy is shown below. Targets can be both local and cloud based object storage plus other secondary storage options such as disk or tape. 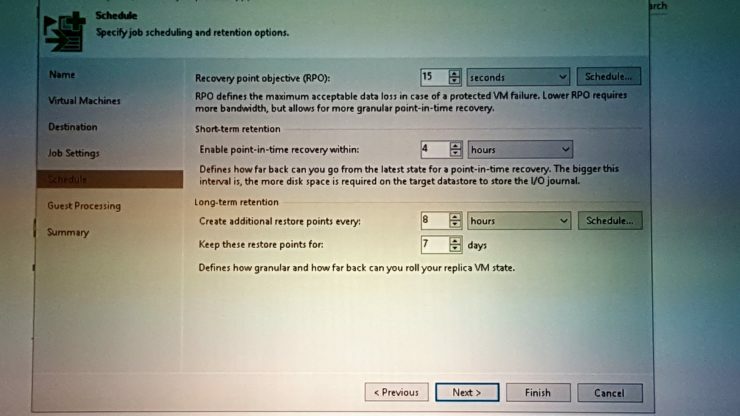 The Veeam backup and replication version 10 release data has not been announced yet, the official V10 page just lists it as coming soon. Veeam 9.5 update 3 is expected imminently. When v10 is release I will of course upgrade my Veeam version numbers and upgrade process posts.